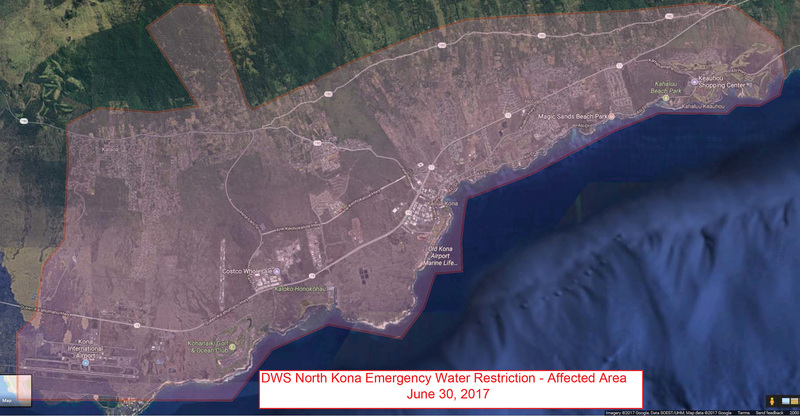 North Kona water restriction area. This is an Emergency Water Restriction Notice for North Kona District customers for Monday, September 25 at 5:30 p.m. Repairs to the deepwells remain a top priority for the Department. For more information, go to www.hawaiidws.org and click on the links on the front page. Water tankers and drinking water stations are now situated within the affected area for the public’s use. To report any observed wasteful use of water, call 961-8790.